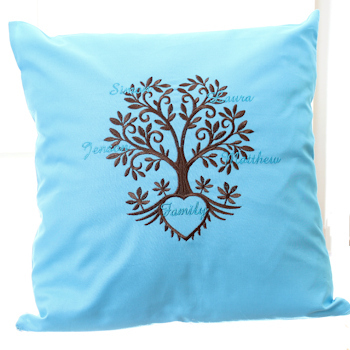 Bespoke embroidered cushion beautifully embroidered with a family tree and the names of your choice. Please enter your names with a comma between each name. Approx 41cm or 16 inch square 100% cotton cushion cover in Your Choice of Colour. Select an embroidery text thread colour for the names. The tree colour may alter to coordinate with the cushion colour you choose. If you have any requests please email when ordering.